Unseen Films: What went wrong with the Jersey Boys movie? There has been a lot of hand wringing and second guessing about what went wrong with the Jersey Boys movie. Why aren’t the reviews better? Why aren’t people flocking to it? Was Clint Eastwood the wrong director? Did it need big stars? Having seen the film I’d like to offer my two cents. For those who don’t know, Jersey Boys is the story of Frankie Valli and the Four Seasons from before their creation to their break up and it ends (its not giving anything away) with their induction in the Rock and Roll Hall of Fame. 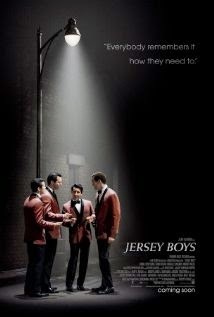 The film is based on the hit Broadway show and it stars John Lloyd Young who won a Tony for the Broadway show. And outside of Christopher Walken there are no big names in the film. I love the Broadway show. I’m an early adopter- seeing the show in previews I went out and sold it to friends and family. Bits of it are among favorite pieces in any Broadway show. The show blends the story and the music so that that the songs are sometimes the songs they are recording and other times they are used to move the plot as they reflect emotion and the characters mental state. The show is a essentially a grand fantasia on the Four Seasons story… the film is not, which is why it never really gains much altitude- until the end. While watching the film I was okay with it. Hell, its not a bad movie. I was enjoying myself. It wasn’t until the final sequences- at the Rock and Roll induction ceremony and the end credits dance number that the film sprung to life. Here was what the film could have been- here was the magic the story needed. Sadly the end pieces are so good it makes the rest of the film (which is good) seem less than it is. It’s a heartbreaker to realize that the film never was going to work because they chose the wrong way to tell the story. That said- its good film and worth seeing.